Shelter is a fundamental part of human existence, and it is as varied as the humans who need it to survive. At its most basic, accommodation is a simple shelter with a couple of barriers from the wind and something to keep the rain off, but at the other end of the spectrum we now live in a world where you can stay in a hotel with your very own bath butler (I’m not joking). Deciding where to stay on your trip can be a big question, and can have an impact on the type of trip you end up having – there are pros and cons for each style of accommodation, and hopefully this blog post (and part two!) will help you to decide which one is best suited for you and your trip. Part One is dedicated to the more basic style of accommodation, looking at wild camping and free accommodation options, but if you’re looking for something a little more luxurious, then why not check out part two for information about hostels and hotels (coming soon). We have come a long way since hanging out in caves, however as an accommodation option, caves are still awesome! They make amazing shelters, and without doubt will provide you an adventurous and memorable night’s sleep! Unfortunately, you won’t always be able to stumble upon a conveniently placed empty cave every time you need one, so sometimes we have to be a little more creative, but with the right outlook and a few bits of basic equipment, you can find unique accommodation almost anywhere in the world as this beautiful blog post from my friend Tom demonstrates. Wild camping spots are varied which means there is no single thing to look out for, other than somewhere that is protected from the elements, allows you to lie down, or has space to pitch your tent or hammock. When you start thinking outside of the box, your wild camping spots don’t always have to be in the corner of a field (although there’s nothing wrong with that!) they might be a rock igloo up in the mountains, a bothy, or even a second world war gun emplacement! 1. Even if you’re out in the middle of nowhere, someone probably owns the land you’re planning to sleep on, so always ask permission of the land owner if this is a possibility, and if they say no (which in my experience has never happened) then accept it humbly and move on. This is especially important in places where wild camping is illegal - although I have never heard of anyone getting themselves in any real legal hot water by wild camping in UK, if you have permission of the land owner, then you’re covered, and you can sleep soundly knowing it definitely won’t be a problem. 2. Once you have sought permission, then make sure you are considerate of the environment and leave no trace of you having been there – as well as the obvious things like taking your rubbish with you, and not burning it down with a giant fire, also make sure you aren’t leaving a ‘visual trace’ like pitching a bright orange tent in an otherwise unspoilt vista – a low profile is the key and you are much less likely to give someone a reason to ask you to move on. 3. Arrive late, leave early. This is one of the golden rules of wild camping, and means you cause minimum impact to the place you’re staying. Don’t start setting your tent up in the middle of the afternoon, instead wait until dusk and set it up then, not forgetting to set that alarm so you can be up and out early in the morning – you didn’t want to miss that sunrise anyway did you? The legality/attitude towards wild camping is usually a grey area, and there are plenty of blog posts about it out there, so I’m not going to go into much detail here, save to say that there are some parts of the world like Norway, Sweden, and Scotland, where the right to roam act (or equivalent) allows you to legally camp wherever you want in the wilderness, providing you aren’t interfering with people’s property or getting in the way by camping next to roads etc. 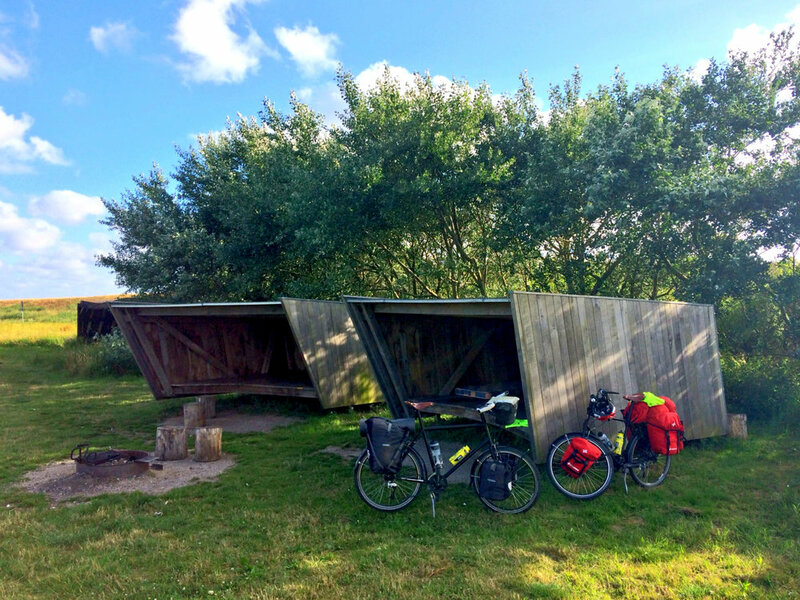 Elsewhere, like in Denmark, wild camping is illegal, but they have taken matters into their own hands and have developed a network of awesome shelters all over the country where you are allowed to stay for free, with fire places, water sources, and toilets at some of them! You can even download their app and use the mapping feature to find all the available shelters in the whole country, trust me, they’re awesome! Another massive tick in the positive column for wild camping is being out there in the world. Because you aren’t behind a closed door, you have to interact with your surroundings more than you would in a different type of accommodation, which means as well as dealing with the weather and the odd stray animal, you will also interact with people that you might meet – In my experience, this is one of the best parts of wild camping, as it often this leads to the most unexpected situations and conversations, which usually turn out to be the best stories of your trip, like how I went from contemplating sleeping on the streets of Khartoum, to living it up with the legend that is Aziz the Sudanese journalist who, in the middle of the night, took us in off the street and into his home to drink tea and eat cake! Part of the ability to sleep outside comes for the gear we carry with us. Trying to figure out what gear to take can leave people confused, deterred, or worse - poor, having stumped up an unnecessary amount of money to get the latest/lightest camping gear. Unless you’re off to the South Pole (which granted would be an amazing place to wild camp!) you don’t need to buy top of the range stuff, and you can definitely get a good set of gear together which will cover most situations you are likely to find yourself in without breaking the bank. Sleeping Bag: Your sleeping bag needs to be warm enough for the coldest night, this will vary massively depending on where you’re going, but unless you are hitting sub-zero temperatures, you probably won’t need a 4-season sleeping bag. Size and weight are only important if you are having to carry it large distances, think about if you want to be lugging around a giant bag with you or not. To start with I would always go for a synthetic bag over a down one as it maintains its insulation when wet. Don’t forget there are also other ways to make sleeping bags warmer – think about the clothes you’re going to sleep in, and maybe adding a warm liner to your bag if it is on the thin side. Bed Roll: A mat to go between you and the ground is crucial if you want to stay warm and comfortable. Inflatable ones are good if you want to save weight, but they are often quite expensive, and also prone to getting punctures (think how you’re going to repair yours if you go for this option!) As good, although a little bulkier, is the classic foam mat. I’ve had mine for over 20 years now, and it’s still going strong and comes on pretty much all of my wild camping trips with me – it’s awesome! Bivi Bag: If you’re trying to save weight, or have opted not to go for a tent, then a good bivi bag will keep you and your sleeping bag dry. There are quite a few out there, and they all do a similar job, but I would check what the material is (go for Gortex not plastic), and how big it is – it needs to be big enough to fit your bed roll, sleeping bag, and you in! Avoid the plastic survival bags – They’re great for an emergency, but sweaty and full of condensation if you try sleeping in one for the night! Tent: This is probably where you could spend the most money, but it’s also where it’s easy not to. As we’ve mentioned elsewhere in this post, when wild camping you won’t always need to use your tent, as other element defying shelter options might present themselves, so something mid-range will definitely do. I bought my Vango Banshee 200 for £80 over five years ago and it has kept me warm and dry in the mountains of the UK, survived the wilds of the Tanzanian Savanah, and stood up to a sand storm in the Sudanese Desert. Even when the poles broke in the middle of New Zealand, I was able to string it up with a bit of paracord, and it still did its job stoically. Think about the length of your trip – if you are planning on cycling round the world, you will probably want to invest a bit more money on what will essentially be your home for a couple of years, but if your trip is only a couple of weeks somewhere not too cold or wet, you can probably get away with something much cheaper! Tents aren’t the only portable accommodation option out there – how about a spot of hammock camping to mix it up? Mosquito Net: If you’ve got a tent this is less of an issue, but if you’re planning on sleeping out in the open, especially in the tropics (or the Scottish Summer!) then a mosquito net will make your life much more bearable – a body covered in mosquito bites is surprisingly demoralising! If you prefer a solid roof over your head, but still want to keep your accommodation on the cheaper end of the scale, then don’t fear as there are a few different options out there which still provide free accommodation and can provide you with a unique experience. Couch Surfing is a hospitality and networking service full of people from all over the world who have a free space in their home for a needy traveller. Hosts are specifically not allowed to charge their guests for staying, instead reciprocal hosting of someone else in your own country is encouraged as payment. Couch Surfing is a brilliant way of keeping your costs down, meeting new people with a local insight of their area, and especially good for visiting cities where accommodation is often pretty expensive. Warm Showers is a similar network to Couch Surfing, but specifically aimed at the cycle touring community. Although not quite as populated as the Couch Surfing network, Warm Showers has members from all over the world who provide somewhere to stay, a warm shower (obviously!) and a plate of food for the road weary cyclist. More often than not, the members are cycle tourers themselves, and so are a source of useful cycling information, and awesome stories from the road. A brilliant resource if you are planning a cycling trip. If you are looking for more long-term accommodation options, you could always look into opportunities which will provide accommodation in return for volunteering, such as WWOOF or WorkAway. Due to the location of these opportunities and the type of work you might be doing, you often get amazing accommodation options in return for utilising your skills. If you want to experience a different part of the world and contribute whilst you’re there, then this can be a way of doing it within a timescale which suits you. Pros: Cheap, Unique Spots, Amazing Scenery, Sunrises, Sunsets, Flexibility, Good chance of meeting interesting people, Almost guaranteed to have an adventure! Cons: Without the right gear there’s potential for getting cold/wet, sometimes you won’t be able to find that perfect spot, and will have to sleep on a building site or a petrol station car park, difficult to do in more built up areas, not good for long term accommodation. I’d love to know what you think of this post, maybe you are also a fan of wild camping? IF so, then I’ve love to hear where is the best/worst place you’ve slept is? Maybe you have you always wanted to give wild camping a go, but still have some questions or reservations? Again, if that’s you, I’d love to hear from you, so why not leave a comment below, or send me a message by email or social media? Did you find this post useful and want to know more about planning an adventure? Then why not check out my A to Z of Adventure post with an outline on where to start planning your next big adventure.